Geshe Sherab will give some open talks on developing a healthy motivation, free of the eight worldly concerns. 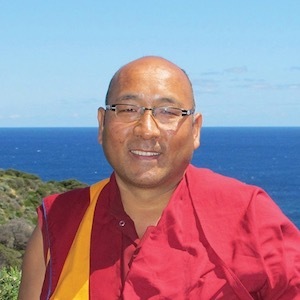 Geshe Thubten Sherab is the very popular resident teacher at our Dharma center in Santa Fe, New Mexico, Thubten Norbu Ling. For part of the year, he travels to teach at centers around the world. He teaches in English. Originally educated at Kopan and later Sera Je, Geshe-la is very closely connected to our FPMT family. In 2001 he was sent by Lama Zopa Rinpoche to New Mexico to serve and help at International Office of FPMT as well as teach at Thubten Norbu Ling in Santa Fe and Ksiti Garba Center in Taos as resident teacher. He also served as Board member of FPMT for 2 years during that period. By end of 2003 in December he returned back to Nepal to do his own practices. In 2006 he was appointed as Head Master of Kopan monastery and served for 4 years. He served at as acting Abbot for a year in 2011 when the late Guru Khensur Rinpoche Lama Lhundup became ill.